Berlin Optical Expressions offers a complete range of comprehensive eye care services to all of our patients, and we’re excited that you’re one of them! Your first visit is our chance to get to know you and your eyes, and for you to get to know us. If you have medical insurance that includes vision benefits, or even if you’re not sure, bring your current insurance cards with you and we can help you find out, and bill your insurance company as needed. We do this every day, so we know what we're doing. 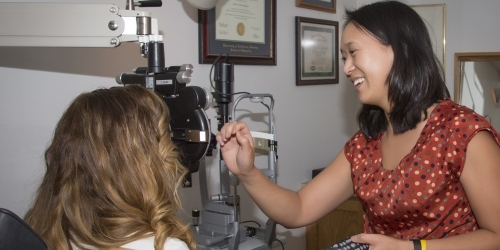 Your first eye exam with us will take around an hour, including refraction, dilation, and prescription. Should you require new single vision glasses, we can make those for you here while you wait; that will take a little longer. We have an extensive optical showroom with thousands of frames to choose from, and an on-site lab to produce your new lenses in-house. 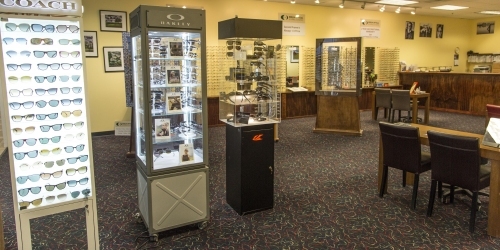 The longest part of your visit will be the time it takes you to try on hundreds of different frames and pick the right one for you. We recommend giving yourself the time to browse our extensive collection before your exam; once your eyes have been dilated, it can be a little more difficult to pick the best frames. The Refraction Test is the exam your eye doctor uses to determine your exact eyeglass or contact lens prescription. Your eye doctor will place a “phoropter” in front of your eyes, alternately showing you a series of different lens options and configurations. With each different lens option, you will be asked to identify the lens that appears clearer. Based on your answers, your eye doctor will fine-tune the lens power and arrangement, ultimately arriving at the optimal eyeglass or contact lens prescription for you. It's powerful, precise, and completely painless! 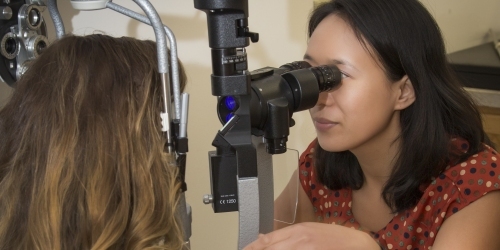 Our doctors will dilate, or widen, your pupils during your eye exam to get a closer, clearer look at your optic nerve and retina. Pupil dilation helps us better identify and diagnose any potential eye conditions that could lead to vision loss, glaucoma, retinal damage, or other concerns. Your eye doctor will dilate your pupils with dilating eye drops – they generally take about 10-20 minutes to start working. Dilating the pupils with eye drops has the effect of temporarily increasing sensitivity to light and causing “blurry” vision at close distance. This effect can last up to 4-6 hours, so we recommend you bring sunglasses with you for when you’re ready to leave. You might also consider having a friend or family member drive you to and from your appointment, just to be on the safe side. If you do not have a pair of sunglasses, we can usually provide a disposable pair for you to use. Dilation is painless, but a little disorienting. The benefits of being able to see more clearly and provide better care for your eyes, far outweigh the minor inconvenience. 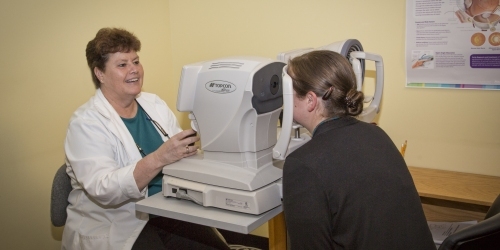 Click here to hear more about the importance of the dilated eye exams from the National Eye Institute. Are You Wearing Glasses Right Now? If you currently wear eyeglasses or contact lenses, including prescription or non-prescription reading glasses or sunglasses, please bring them with you. Also, if you currently use any eye drops, ointments, or other medications in and around your eyes, bring those along with you as well. We’ll review whether these are still appropriate or if there’s a better option going forward.